Long Weekend in Sunny Florida! – Eat, Drink, and Go! 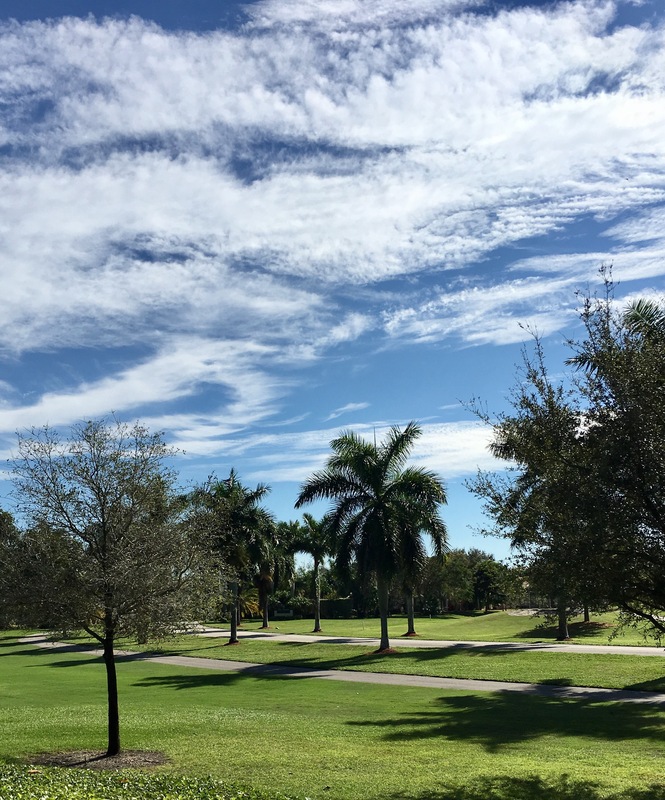 Had a nice little getaway after the holidays to beautiful West Palm Beach, Florida! Ok, I’m totally ready to retire here. The communities are gorgeous, activities are endless, and the weather – well, considering it was snowing at home, you just can’t get any better for January. 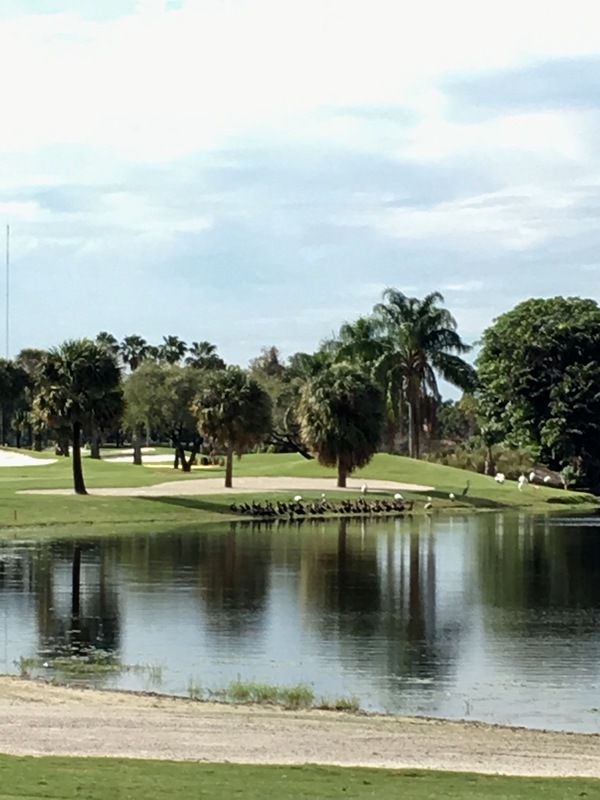 I played a great round of golf in the Lake Worth area and enjoyed every minute of the perfect 78 degree weather. I’m not very good at golf, but I can hold my own and keep pace. 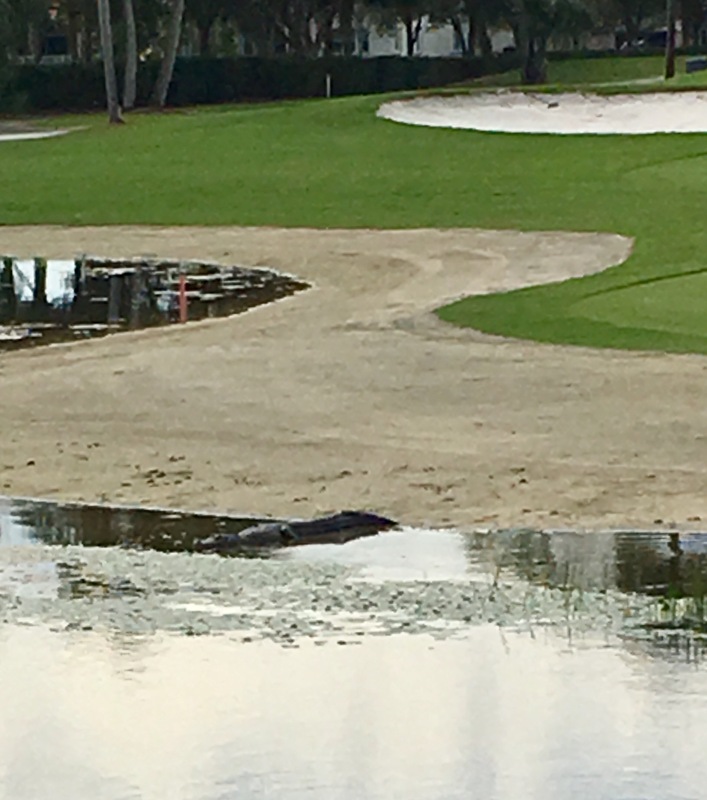 Even saw a gator on the beach across from an elevated tee on a par three!! See it? Right at the water line. We didn’t have to get that close, and luckily he stayed where he was! I must admit, I was a bit nervous each time I landed near a water hazard (though unfortunately I found my way into several of them!). Golf is a wonderfully humbling game. I’m sure there are plenty of blogs out here focused on it, so I won’t. I just enjoy being outside and away from the world for a little bit!! For our Friday evening adventure, we went to Delray Beach. What a great evening hotspot!! We had insider information to get there early for parking and since we didn’t have dinner reservations, it wasn’t a problem getting a table at 6:00. Yes, I like to eat early. 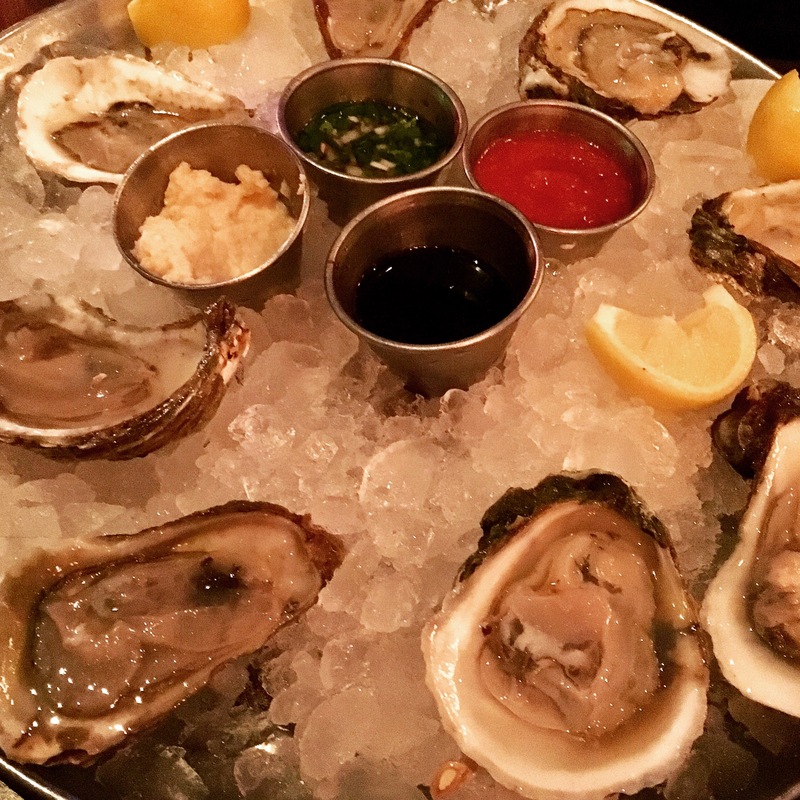 We settled down at City Oyster right along the main drag – Atlantic Avenue. 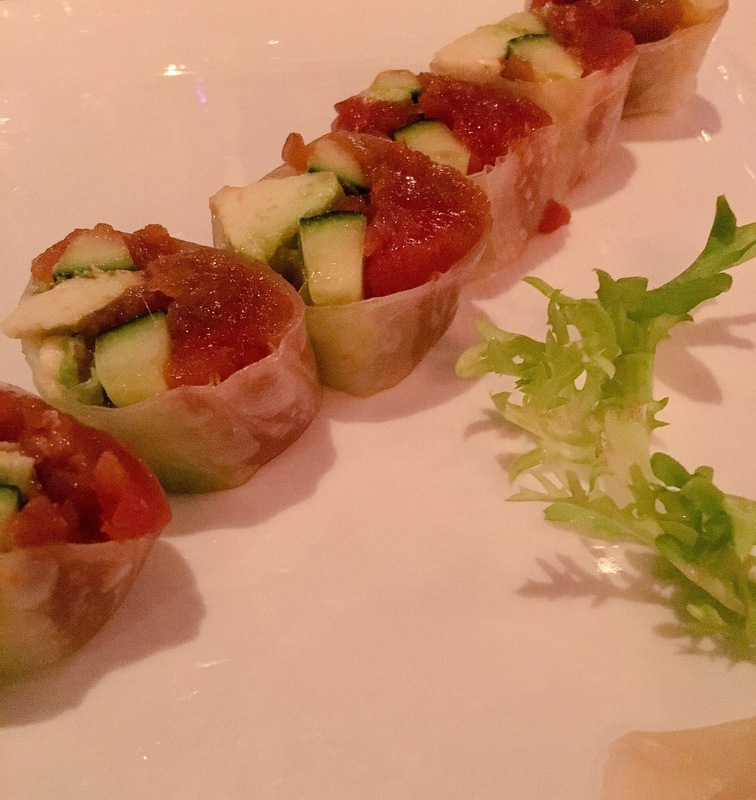 A great seafood restaurant with bountiful raw bar selections, sushi, and plenty of other menu items. Too bad I couldn’t try more!! We started with some P.E.I. and Bluepoint (both east coast) oysters. I think I liked the P.E.I. ones just a little better because of a crisper, cleaner finish, but the Bluepoints were also yummy! I chose a no-rice sushi roll of tuna, avocado, and cucumber wrapped in rice paper and laced with truffle oil. Of course I did. 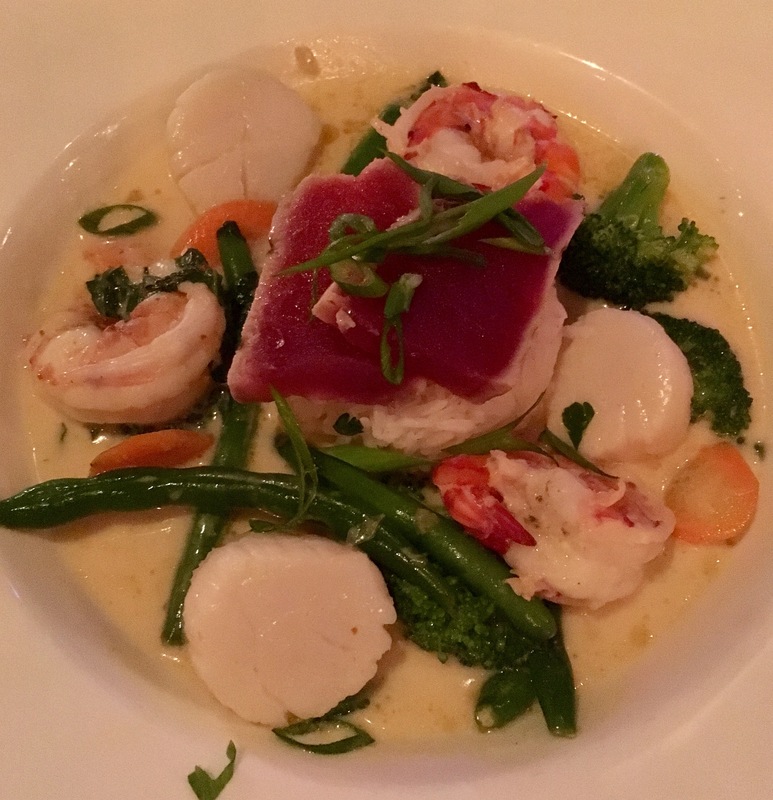 The hubs got a seafood medley of scallops, shrimp, and tuna in a coconut curry broth with jasmine infused rice. This was warm and tasty! Not too heavy on the curry, which I like. 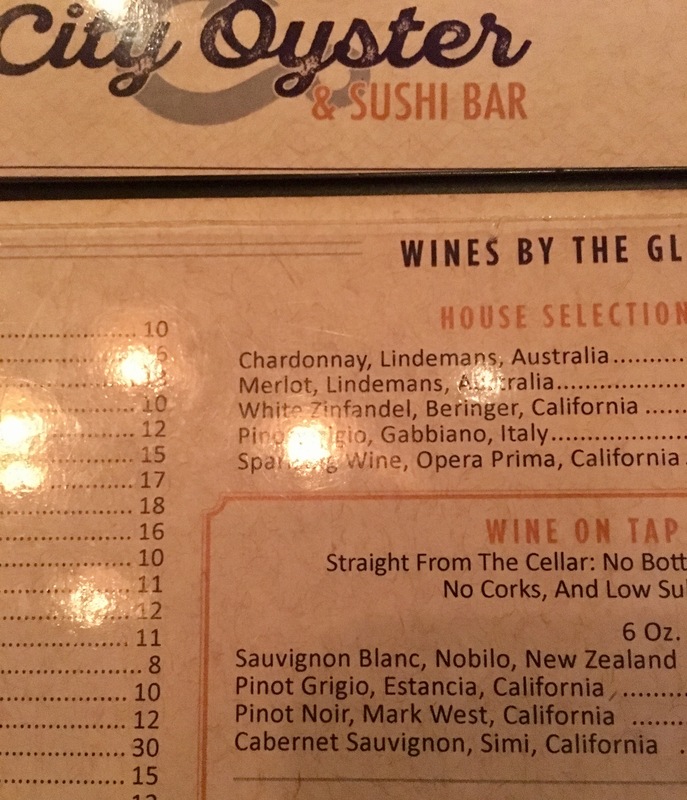 And to my greatest delight, my favorite white wine on tap here!! Nobilo Sauvignon Blanc! Thought that was pretty cool to get it “straight from the cellar,” though I’m not sure I totally understand that. Nobilo is from New Zealand and their Sauvignon Blanc is my go-to white that pairs perfectly with seafood. Or just a glass. Or bottle. All those things. 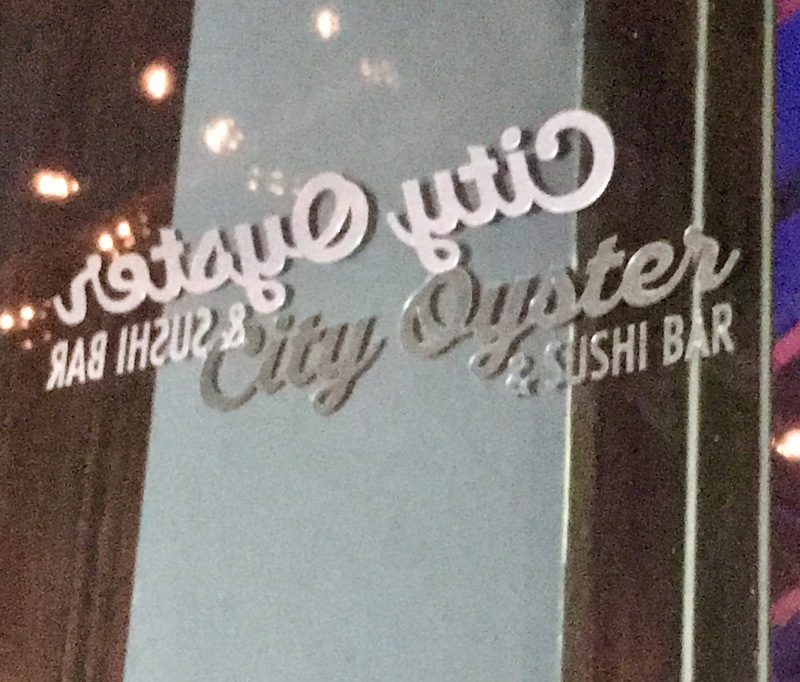 Anyways, City Oyster was a great spot for dinner. The ambiance was comfy amidst an increasingly growing crowd as the night progressed. We sat on the edge of outside and it was perfect. It was also a perfect night for a passagiata!! And guess what was just a short walk away? The beach!!! Delray Beach at night! Remember those postcards (back when we used to send postcards) that showed whatever beautiful place you were at “at night” and the card was just black?? Hehe. I miss postcards. Maybe I’ll consider bringing them back into my repertoire, I feel like I’ve still seen them in stores. Right? 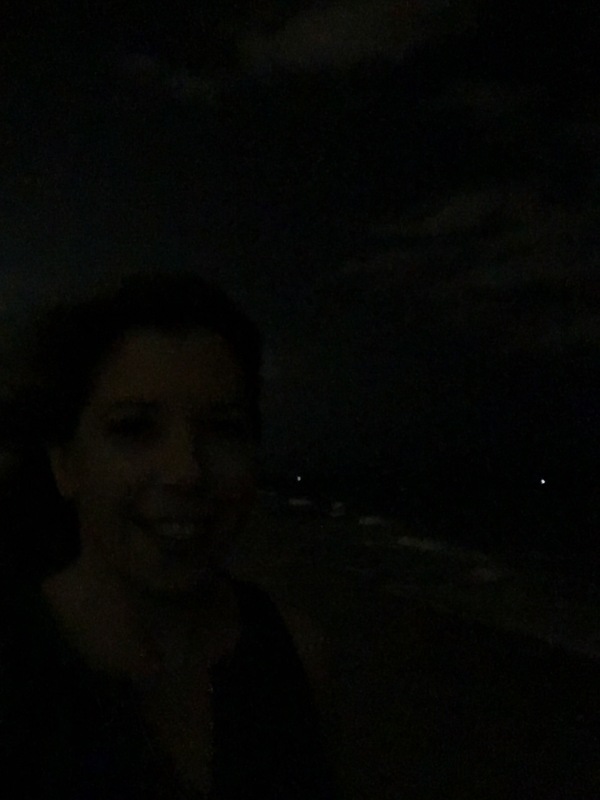 Well this was Delray Beach at night, not pitch dark, and just so nice – a balmy breeze that wasn’t cold at all, but just right to give the day’s warm sun a quiet respite. 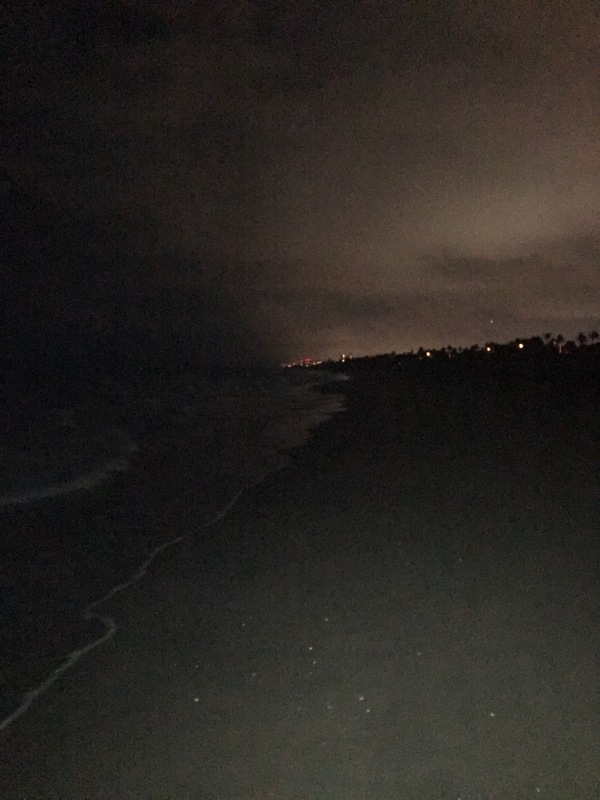 This one above is me on the beach at night! If you look closely, you can see the waves gently brushing the shore and a faint image of yours truly! I’d love to spend more time down here – as it got later, Altlantic Avenue really heated up. Live music, great open air restaurants, clubs and bars. We had great after dinner drinks along the Intercoastal Waterway at Deck 84 as we made our way back from the beach. I definitely recommend checking out Delray Beach at night!! We cruised a bit south to Miami and experienced some rare bad weather of heavy rain, even a chill in the air, but ended up at a great restaurant for dinner – Beer & Burger Joint in Miami Beach. I admit that I didn’t snap any pics, but I was quite hungry and more focused on spending time with the family to think of taking food pics! However, the food was delicious! We shared two burgers and I’d recommend both, so grab a buddy if you’re going here and splitsies! The “Hey Jude” is a chicken burger with bacon, avocado, and sweet potato fries and the “Wild Thing” is a bison burger with blue cheese, tomato jam, and duck fat fries. Mmmmmmm. Very satisfying!!! Mostly just some high quality family time for me down here, I couldn’t ask for a better getaway after the crazy holiday season! Thank you again to my amazing hosts!! I think I like this idea of travel AFTER the holidays…hmmm. Ok, this is going to have to be a thing.